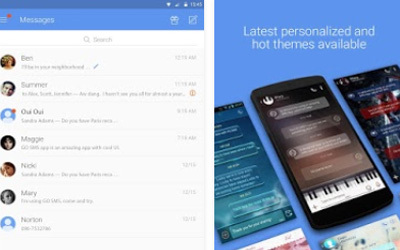 Previous version GO SMS Pro 7.26 apk for Android will help you to downgrade or install older app easily. This is one of the best Communication apps. There is no doubt that GO SMS Pro can be considered as the messaging app which can be replacement for SMS. It comes with the design which is fast and sleek. Various customizations are available for making people keep in contact with important people in their life. Of course there are pros and cons which can be found associated with the app. This app comes with pop up ability with notification. Users can send quick reply with this app. It is also possible for them to setting the privacy modern for keeping the messaging text private. Customization can be done for individual contact with different style of chat, notification sound, as well as different signature. Customization can also be done for the themes, animation effect, and font. It comes with multiple plug-in for various purposes. There are more advantages which can be found from this app. However, we can make sure that there are also some drawbacks from this app. When people want to open the app, maybe it will take time a little bit longer compared to the standard app for messaging. People can customize their app but it comes with limited themes option. Avatar popup Show the contact avatar above all apps when new messages arrive. It’s nice to be able to have an app that doesn’t look like everyone else’s. Very powerful and personal.